This young squirt, with his strap falling down, an Arbus signifier for dishevelment and extreme emotion (see the provocative Girl in a Shiny Dress, N.Y.C. of 1967), with his preposterous lack of physical strength, is ripplingly physical, plausibly military, conceivably terrorist. 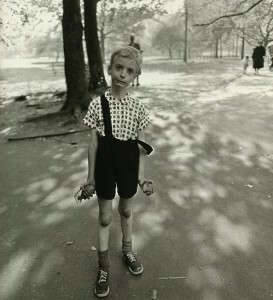 He is ready to fight back; indeed, his stance itself is a challenge to this stranger he met only once, photographer Diane Arbus, to leave him be. One is tempted to see the photographer as a bully, except that the boy sees himself as formidably armed with his plastic grenade and other invisible weapon. The little boy has the look of an old fashioned mad bomber more than a crisply controlled soldier. His defense is imaginary. Arbus did much work with imaginary identities in this era. She photographed extensively a man who believed himself to be Uncle Sam, and the Oklahoma-born claimant to the throne of Byzantium (2). To implicitly classify a child as a freak, since this was Arbus’s life’s work and the term she used to describe her subjects, is obviously either unkind or at least careless. This is the ethically ambiguous element of her art which so many critics have referred to, which appeared most vividly in her later series on the mentally retarded, who may have been incapable of giving consent to her images and their publication. Likewise, the boy’s parents may have given consent to Arbus’s work with their child, but you can see at a glance that the child’s consent was far from clear. “His puny rage, and the way it made him pull the trigger on that grenade, made him a perfect cartoon to represent a nation choking on its own bile over Vietnam and greatly diminished in self-image (6).” This is a brilliant interpretation by curator Colin Westerbeck, but one that belongs to the world of reception and not conception, as in 1962, the Vietnam War was only a gleam in JFK’s eye (7). Traditionally, the mentally handicapped and the mentally ill are not to be discussed or documented in the interests of good taste, outside medical texts. These unfortunates are the obviously invisible, creatures from whom we avert our eyes. Children in distress or on the brink of explosion (or exploitation) are also to be ignored, kept from violating a pretty Hallmark aesthetic, even, often, by their mothers. Visual signifiers of distress are often inadequate to get our attention; it is thus that a child is bequeathed his terrible screech, which would earn him, in 1962, a brusque slap. In fact, one might say that the psychotherapy industry is founded upon such moments of neglect, rebuke or forgottenness. What is foremost in its exceptionality is the image’s brilliant illustration of one of the most life-affirming concepts of the late French psychoanalytic theorist Jacques Lacan (1901-1981). What Lacan called jouissance, he ascribed to the radiant life force we see in the young of all species, which will propel them through the dangers of youth and over the vast terrain of learning they must navigate. The puppy chases its own tail in circles to discharge energy. Colts romp when walking would suffice. In every respect, this force is dissipated over the course of one’s life. Some of this life-force will continue up to the moment of death, but it is constantly depleted. This is why adulthood is marred by physical creakiness, and restricted curiosity. Here, we have the collection of childhood energy in such abundance that the child doesn’t know what to do with it, a display of confusion and glory. (1) Hugh Hart, “Post-developments: For the subject of Arbus’ “Child with a toy hand grenade,” life was forever altered at the click of a shutter”, San Francisco Gate (Sunday 19 October 2003). (2) Patricia Bosworth, Diane Arbus: a biography. 1984. (New York and London: W.W. Norton & Company, 2005). (5) Diane Arbus: An Aperture Monograph. 1972. London: Thames & Hudson, 1997. (6) Colin Westerbeck and Joel Meyerowitz, Bystander: A History of Street Photography. (New York: Bullfinch, 1994). (7) Lawrence Freedman, Kennedy’s Wars: Berlin, Cuba, Laos, and Vietnam. (New York and Oxford: Oxford UP, 2000). This entry was posted on Sunday, October 31st, 2010 at 3:37 pm and is filed under Photography. You can follow any responses to this entry through the RSS 2.0 feed. You can leave a response, or trackback from your own site. “physical creakiness, and restricted curiosity”… Yep, that’s me. Great article as always. Can’t wait for the next one! Of course I loved it, and even though you are writing about a photograph this is a fine example of “deliberate writing” I talked about in your short fiction post. I mean I am made to feel engaged without participating. Like TV. I love TV. This seems to be (simply) the case with McFarland’s “large colour photographs.” He aims to “return the image as much as possible to its original appearance, seen by the eye.” How foolish, backwards even. This approach embraces the medium’s early mimetic criticism, it’s irony without intrigue. It doesn’t help either that he is wont to make a comparison between the subject matter and the photographic process. Do we really care that his photographs of gardens and the gardens themselves are idiosyncratically linked by there their reliance on basic elements – “light for exposure and energy and liquids for hydration and processing?” I sure as hell don’t. I don’t think Minor White did either, and he was a botanist! Modernist photographers like Arbus, Friedlander, White et al. were active during the medium’s early reception as a new young art form. They played an essential role in showing the public the medium’s potential beyond the snapshot. They created new ways of seeing that surpassed mere “looking.” They employed “world-reflecting” approaches to making “world-creating” images/series. I thought Photoshop would free photography from itself, but artists are still insisting that their images are not “photoshopped,” as if mentioning so would add fifty points to the picture’s worth. Good photographs are good photographs despite their origins. If a lot of cropping and contrast adjustment meant that I would not have to look at another mundane, “poetic” portrait of a kook then I’m all about it. But even this horse is dead. Tanyth Berkeley needs more than “interesting” people to make her photographs interesting. Modernist photographers still dominate contemporary photography, because photography as a form of art has not changed much. We have new technology, but we’re still using it in old ways. I think artists today – just as they did four decades ago – are preoccupied with embracing the medium’s “unique” realness. The modernists dominate still, because nothing has really changed. The Met’s exhibition, Depth of Field featured some really great work by contemporary artists like Uta Barth and Adam Fuss. I think Cynthia Greig has some interested work as well. Superb. Confusion and glory. You’ve drawn out subtleties and ambiguities, rather than the plain as nose on your face subtexts. Erin, first of all that is one of the most beautiful descriptions of jouissance I’ve read. I love the images you attach to it. And I would say that, in terms of accuracy, it seems like it may depend in part on the context or purpose of the definition (since, as you said, it could 30 pp long), and yours works well with the description you are giving. In terms of a rigorous accuracy in faithfulness to Lacan, I wouldn’t say that anything is wrong there, but you leave out a crucial part of the concept, and that is death, or the more precisely the death drive. Sorry if I’m being a stickler but I recently did a whole paper on the topic of jouissance, ethics, and the death drive at a psychoanaltyic conference in boston. But the concept of jouissance illustrates the very complicated and paradoxical relation between life and death for Lacan. You are absolutely right about the overflow of energy that is jouissance, and in fact jouissance is precisely this transgression itself, the very idea of transgression. This is why it is linked with the death drive, since it contradicts the conservative, economic, homeostatic tendencies of life. You are right about the leaping and bounding, but in fact, the bounding across a field could easily make the colt or cub prey, or expose it other dangers (as does of course curiosity). And in fact, this is not a secondary effect, creatures play precisely BECAUSE there is a drive to transgress, to throw themselves in the way of death for no biological purpose at all. And this, to my mind, is why it is such an interesting concept, because now death becomes the grounds of life, becomes the ethical aspect of living, but only in this sense of pure transgression, its being-as-overflow. It is necessary for life to contradict itself in order to survive, for pure self-preservation would never leave home, so to speak. Death and play have a fundamental relationship. For instance, you rightly point out that as we get older we tend to lose our overflow of energy and risk-taking curiosity. But Lacan would say this has nothing to do with a life-force in any biological sense. Just the opposite. It is because as we grow closer to biological death, we repress it’s inevitability more and more and cling to life, to self-preservation. Death loses its aspect of play, and we lose our openness to death and stop living or experiencing the life force of life, which is also the death drive. To quote from my paper, I say that jouissance is the drive in death drive. And the death drive is not that destructive impulse it is usually taken to be (though it can take that form too). So although jouissance is more fundamentally related to the death drive (it “brings death into play” to quote L.) you are absolutely right that it is a life-affirming concept. And I would add, an ethically affirming concept as well. Transgression or overflow of our own boundaries is a form of self-annulment (death), but also of course another form unity or relation. Beautiful meditation on that amazing photograph. The concept of jouissance seems more than relevant here. That’s a wonderful visual analysis and the psychoanalytic connection is great. Well done. To whoever wrote this article. You seem to know about this photo and I was just wondering if you could help me locate the spot it was taken in Central Park. I have an eccentric habit of visiting famous photo sights. Along with this and Arbus’s “two teenagers” (I know it’s not the full name) on Hudson street. Please email me if you can. Sorry, Shane. I haven’t a clue! Hi Brian. Well, your story is very interesting, but the boy in the photo has been long since definitively identified as the son of the tennis player. Perhaps you had a very similar experience with another photographer. 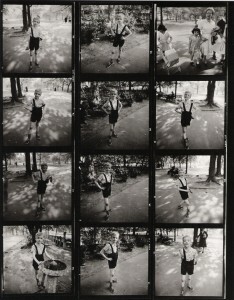 “Giving a camera to Diane Arbus is like giving a hand grenade to a baby,” Norman Mailer said after seeing how she had captured him, leaning back in a velvet armchair with his legs splayed cockily. Arthur Lubon, “Arbus Reconsidered.” New York Times. 14 September 2003.